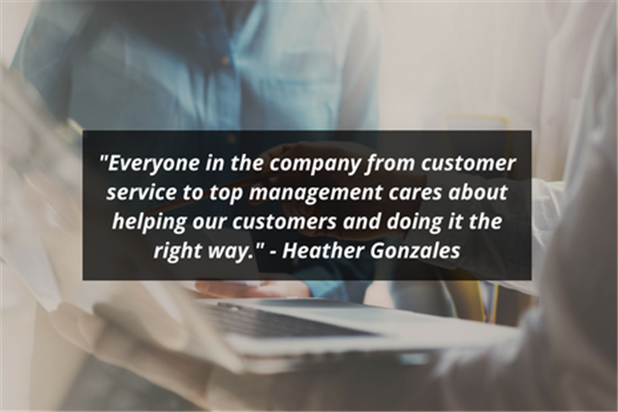 Meet your account manager, Heather Gonzales! 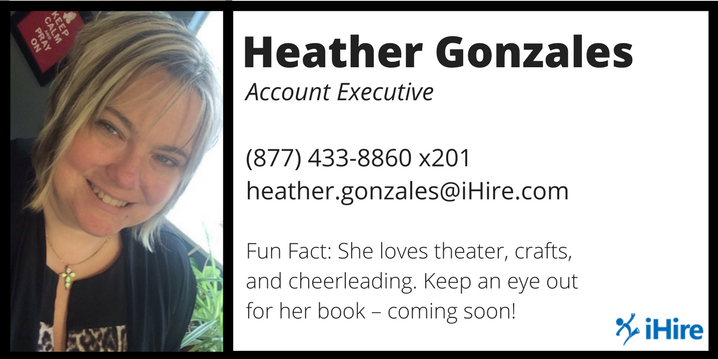 Heather has been with iHire for 16+ years. She’s a customer-focused, solutions-driven professional with a commitment to teamwork and dedication to helping businesses and corporations find the best talent to quickly fill open positions with top-performing employees. Her expert knowledge of the employment industry enables her to help clients optimize their job postings for maximum impact utilizing best practices for keyword optimization and employment ad writing. HG: People. I just love talking with the variety of people over the phone and learning about their lives and their businesses. I’ve had many interesting conversations over the years. I love digging in to determine the best options for their hiring needs even if it means telling someone our service isn’t a fit. I believe in honesty and am grateful that iHire allows it and even encourages it. I love that we only want to partner with clients that we can provide a valuable service to. I also love knowing that I’m helping them solve their frustrations and calm their stress in filling needs that have been ongoing or have just come up. On the other side of things, I love knowing that we are helping qualified candidates find jobs and make their career dreams come true. HG: They care. In my tenure at iHire, I’ve seen this company grow and become better than it ever has been each and every year. Everyone in the company from customer service to top management cares about helping our customers and doing it the right way by providing the quality of candidates they are seeking rather than being solely focused on CPC (cost per click) and only caring about sending as much traffic as possible no matter the quality. iHire has cared since the beginning in 1999 about finding our employers the right talent and finding our candidates the right jobs! HG: It’s so hard to narrow it down to just one story! There are two that stand out most. I’ve worked on one national account for our iHireOptometry site since 2006. In 2012, they left us to try another niche site due to lower rates. They came back to us in 2014 after realizing they get more quality applicants from our service and have been with us ever since. They are one of our many clients that agree you get what you pay for. Another success story that I remember well is from iHireDental. I’ve worked with a particular recruiter since 2008 and although she has moved to a couple different recruiting companies, she always contacts me on her new ventures to get help with her dental hiring needs. Just this year (2017), she brought us a startup recruiting group that is using our new Job Wrap service as an automated solution. I could write a blog on success stories alone! I love working with my clients and hearing how well our service is doing for them. HG: I love resume searching tools. I think it’s really neat to use Boolean search and love the challenge of figuring out all the different keyword options I can use to find candidates that match my clients’ needs. I’m also very excited about the new Job Wrap service because not only are we still providing quality matching candidates to our customers, but we are doing it while also saving them time because it posts their jobs for them. Plus, it’s at a fraction of the cost of our standard rates. It’s a solution that I see working for our clients for quite a long time. HG: Spending time with family and friends is very important to me including, but definitely not limited to, my husband, 2 daughters, and 3 grandbabies. I have a very large, loving family and am truly blessed by them. In fact, my grandmother is still with us at the age of 91 and she comes from a family of 10 brothers and sisters! My husband has 13 siblings and one of my brothers has 12 children. I love being there for family and friends when they need me and do all I can to make sure they know how much they are appreciated in my life. I also teach Sunday School at my church. Spending time with children is such a joy. They are a true blessing in my life. Writing is also a passion of mine and I’m in the process of writing my first book. HG: I wanted to be a child psychiatrist/psychologist for diabetic children. I love helping others and being a type 1 diabetic since I was 8 years old, I figured I’d be able to help by sharing my stories. I still feel I’m helping people manage their hiring stress by giving them relief with the products we offer and helping our job seekers find jobs because of the employers I help our service partner with. HG: I like too many movies – it’s very hard to name a favorite. I’d say The Shack if choosing from recent movies. My favorite book is the Bible. I go to it for daily reading and study, and also for guidance, hope, healing, strength, peace, purpose, etc. HG: The same advice I give everyone now – think outside the box. Don’t spend your time on clichés and doing things the way they have always been done – try something new! After winning my battle with cancer in 2016, I mean this even more. When it comes to hiring, sometimes requirements are way too strict. There are many candidates that train easily and have backgrounds that are relatable and may fit what you are looking for even if they aren’t an exact match. Give someone a shot as long as they meet the most important requirements. You may find out that giving someone the start they need will make them the loyal employee you’ve been waiting for. You may also be pleasantly surprised at what different backgrounds can bring to your team. Eventually, you’ll be thankful for what you did and will have found the diamond in the rough you’ve been searching for.